He is the next big thing in the film Industry.I know him for the past five years. I first met him for my MBA preparatory classes in an training centre (IMS). He was a calm soft spoken lad. The chocolate Boy kinda guy. Later we went on to pursue our MBA goal in different colleges. He entered the media world in a bigger way and now he works for Radio-One FM in Chennai. I met him again after a gap of four years. Boy!!! He looked different. The Amzath I first met in the year 2003 had a new look. He has turned into a stud. Apparently,I ended up in Chennai and call it a pleasant accident, we became room-mates.He is an "emotion-free" soul with a carefree attitude. He just spreads smiles on every one's faces.He is gonna make his entry into the filmworld in a Big way. Yes! He is acting in a movie. 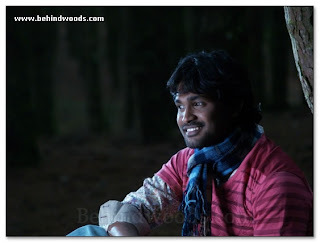 The name of the movie is "Pugaipadam" (Photograph).It is directed by Rajesh Lingam who has come from the stable of one of the biggest directors in Tamil film Industry, "Selvaraghavan" . Gangai Amaran, a very noted music director is making his comeback through this movie. What is his role in the movie? An action hero? Anti Hero? Psycho? Choco-Romantic Hero? Watch out for the movie. I dun know who he is! But I dont mind staring at him! hahahahah! See ya in ummmm another week? I hate being away from my bloggie friends! 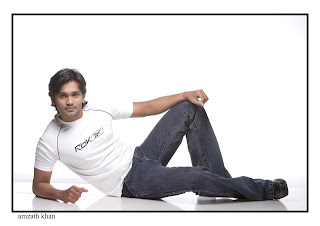 he looks alot like another tamil actor...I cant rem his name...the guy who dances well? i dont get to watch to many tamil movies here,lets see if i get to watch this one very soon.Has the movie released? btw any chance u kno alicia silverstone too??? Oh nice. Amzath looks pretty good. Potential superstar material?! Knowing celebs is cool, especially when you know them from when they weren't celebs! yes .. true.. he will amke it big for sure..
New kinda social networking after quitting facebook and orkut ? Do u really know him. Rite? The actually seems transformed- before- after types. hope he reads this.. will pass your wishes bro.. I have not seen any Indian movies (but I don't watch any movies, so it is nothing personal!) but that man is very good looking. p.s. I know Alicia Silverstone. She owes me money. whats your role in that movie?